Wasabi Ginger Deviled Eggs, a Japanese twist on the American classic. 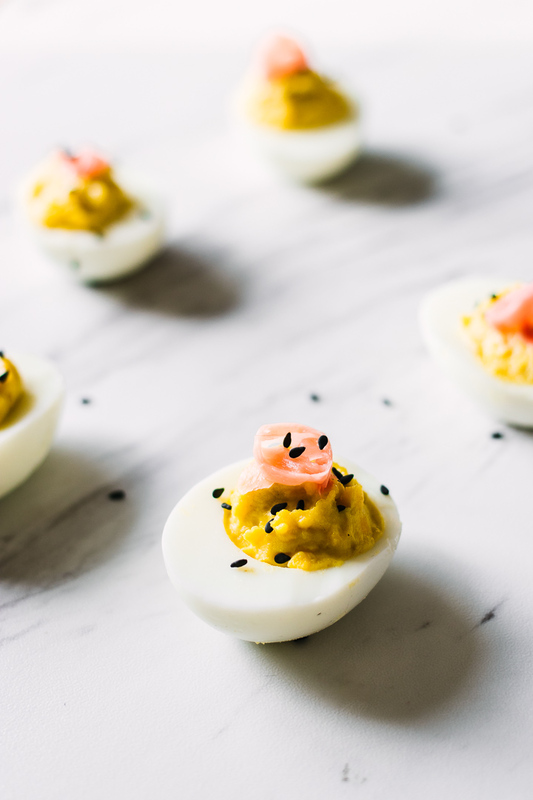 Made with farm fresh eggs, tangy wasabi, minced ginger, and topped with sesame seeds and pickled ginger, these spicy deviled eggs are a perfect alternative to the Easter Sunday tradition. This recipe was originally posted in April 2018 and was updated in April 2019. 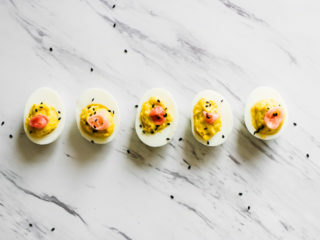 Did you hate deviled eggs as a child? If you’re anything like me, you were a picky eater as a child. If it was fried and it was chicken, then I was fine with it, but mayonnaise? No. Egg yolks? Absolutely not. So of course I hated deviled eggs. I am not sure I even tried a deviled egg as a youngster, I just heard a rumor there were mayo and egg yolks involved and it was a done deal. Not happening. 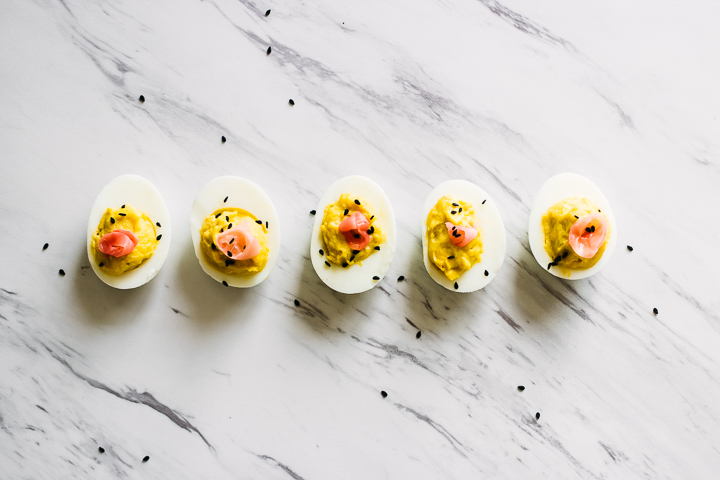 But of course as we age we also (hopefully) grow wiser, and I came around to the little Easter eggs bites and (of course) started experimenting with flavors and ingredients that might take Aunt Susie’s tired deviled egg recipe to the next level. Enter the Wasabi Ginger Deviled Egg. Wasabi Ginger Deviled Eggs are the kick in the tastebuds you are looking for from traditional deviled eggs. Made with wasabi, minced ginger, salt, mayonnaise, and vinegar, the egg yolk filling is spicy, tangy, and packs a flavor punch. Top them with pickled ginger and black sesame seeds and you have yourself a Japanese take on the American classic. Ready to learn how to make these simple, spicy little egg bites? Let’s do it! 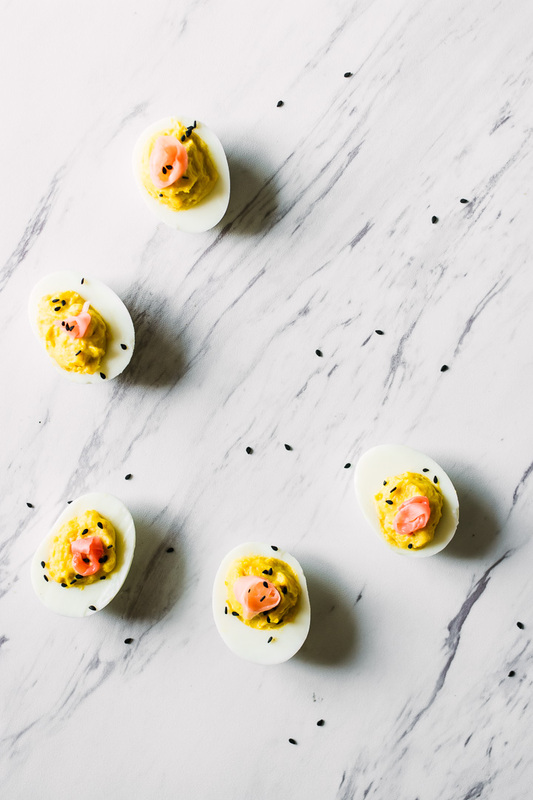 These deviled eggs are ridiculously easy to make and came together in under thirty minutes (and most of that cooking time is boiling the eggs). After the eggs have been boiled and cooled, they are halved and then the yolks are removed to a small bowl. Add the mayonnaise, wasabi paste, minced ginger, vinegar, and a bit of salt and mix, mix, mix (a fork works just fine) until you’re left with a smooth cream that can be scooped into the egg halves. Top each egg with a bit of pickled ginger and sprinkle of black sesame seeds as garnish and they’re ready to go! The great thing about Wasabi Ginger Deviled Eggs is they can be prepped days ahead of time and stored for up to 3-5 days. I made two batches when testing this recipe and the eggs held up well for three days in the refrigerator (I didn’t experiment with keeping them longer because they were just too delicious). You won’t need any special equipment for this recipe, but I will plug my favorite dutch oven because it’s a workhorse in the kitchen and I believe every home cook should have one. Also, if you’re feeling fancy and want to buy deviled egg storage and carrying cases so you don’t ruin the eggs on the way to grandma’s house, then why not get extra fancy and get yourself a deviled egg serving dish? I hope you enjoy these Spicy Wasabi Deviled Eggs! If you like this brunch recipe, you may also like my Saffron Chickpea & Chard Has with Sunny Egg and my favorite Pluot & Brown Sugar Buckwheat Pancakes. Or pair it with this delicious Strawberry Saffron Bellini! If you try this recipe don’t forget to leave a comment and a rating below and let me know how they turn out. And tag me on a picture on Instagram, I’d love to see your spicy deviled egg creations! Hardboiled eggs: Place eggs in a large pot or dutch oven and add water until it is one inch above the top of the eggs. Bring to a rolling boil for 5 minutes and then remove from heat and cover with a lead, letting them sit for 10 minutes. Transfer the eggs to a bowl of ice water to cool them down, then dry and peel. Eggs can be stored for up to 5-6 days before using. For filling: Half boiled eggs (careful not to tear whites) and remove yolks to a small bowl. Add mayonnaise, wasabi paste, minced ginger, vinegar, and salt and mix well with a fork or pulse in a food processor until mixed. To serve: Scoop filling into the egg halves (I used a ½ teaspoon measuring spoon) and top with slices of pickled ginger. Sprinkle with black sesame seeds and serve. Prep Ahead: The eggs can be prepped up to 4-5 days ahead of time. The egg yolk filling can be prepared ahead of serving as well, however will harden over time. Mixing a bit of water will help it to retain its creaminess, but for the freshest taste wait to mix the filling until right before serving. Leftovers & Storage: Wasabi Ginger Deviled Eggs can be stored in an airtight container in the refrigerator for up to five days, but for freshest flavor I recommend eating within three. Thank you! I love experimenting and putting an interesting twist on classic recipes. I can never just leave tradition alone! I love deviled eggs and with the kick of the wasabi and the ginger they sound like a real treat. I was never a picky eater as a child so I bet I would have loved these deviled eggs back then too! You saw the light at an early age…it only took me 20 years, but I got there! You have to make deviled eggs from all the leftover Easter eggs so I guess that is the American tradition. I need to make these for my next tapas party for sure! I love this Asian spin on an American classic! This girl grew up loving plain ole deviled eggs, but you’ve elevated yours to something special. Pinning to my Tapas/Appetizers folder for sure! Great! I love the traditional ones as well now, but I also like to switch up the flavors a bit. It would be funny to bring these to Easter and not tell anyone there is wasabi in them…might start a family feud. Don’t tell them there’s wasabi and then see what happens…maybe not the best idea! My husband absolutely ADORES deviled eggs and wasabi, so I bet he’d just jump over backwards for the two together. Can’t wait to make these for him! Let me know how they turn out, they were super simple to make and are great for snacks all week long as well. Deviled eggs are such a great dish to bring to any party or serve at a party you are hosting! These flavors sound bold and delicious! Yes, the wasabi is definitely bold but the pickled ginger on top really adds another dimension. Let me know if you try them! I already liked deviled eggs, and with this wasabi ginger kick even more!! Wasabi and ginger are two of my favorite flavors 🙂 . Your pictures are so nice! I’ve never met a deviled egg that I didn’t like. This is such a fun flavor combination – love the bit of kick from the wasabi paste! And that pickled ginger garnish is the PERFECT finish! Yes! The ginger adds a refreshing flavor that evens out the wasabi kick. Delicious. How fun is this recipe!! 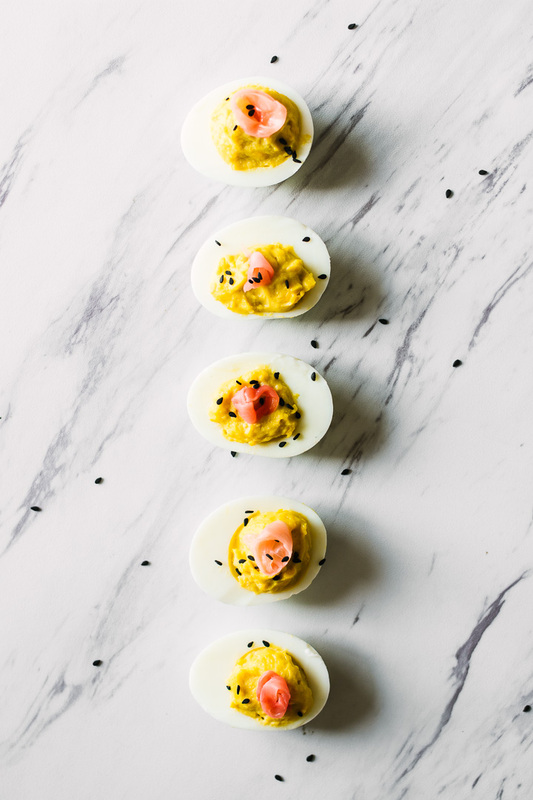 I love how versatile deviled eggs are but your recipe sounds and looks amazing! I love the addition of wasabi and ginger! Great additions!! A fun little Japanese twist on the classic recipe. Let me know how they turn out! Let me know how they turn out! They’re super simple and are great to store and eat throughout the week. Not only do these sound delicious, they look pretty too! I love the unusual twist on deviled eggs with the ginger and wasabi! Such a simple and easy snack and perfect for spring. Thanks for stopping by! Those deviled eggs look delicious and perfect for spring! Also really loving the Wasabi Ginger flavor. Such a yummy recipe! Thank you! They are a delicious twist on the classic, I think they add a nice kick to regular deviled eggs. Thanks for stopping by!